The Kansas State University Agriculture Research Center in Hays has been a pioneer in wheat development for years. Dr. T. Joe Martin, former wheat breeder at the station, paved the way for future breeders like Dr. Guorong Zhang, the current wheat breeder at the Hays Research Center. Zhang is walking in the footsteps of Martin by breeding wheat lines for the High Plains. While the wheat breeders are recognized for new varieties, a lot of people in the background put in hours and hours in supporting roles. Clayton Seaman and Ken Rohleder, senior agriculture technician’s, do a lot of the behind the scenes work you don’t hear about during the development of wheat varieties. Their duties include working on equipment during breakdowns, planting and harvesting plots, and they have many other responsibilities. “Typically I’m one of the people responsible for getting the ground ready to plant. I’ll do some of the planting and harvesting; I’ll do maintenance on the machines and a lot of the other equipment,” Rohleder said. Both Seaman and Rohleder’s main location is the Hays center, but they also work at the other eight additional locations in western Kansas. Garden City, Graham Co., Decatur Co., Colby, Ness Co., Pawnee Co., Osborne and Kiowa. Seaman says these locations help to provide even more data because they are able to see the varieties within different environments in the western part of Kansas. At Hays, they develop both hard red winter wheats and hard white winter wheat varieties best suited for the west. “The way it was explained to me twenty years ago from Joe Martin, was, he bred wheat for the short grass prairie because of the rain sheds and environments he was working with,” Seaman said. Seaman has been at the Hays research center for 29 years. He graduated from Fort Hays State University in 1986 with a general agriculture degree and a dream to go home and farm with his dad. Unfortunately, the hard times of the 1980s hit, and like most farmers, there were a lot of uncertainties about the future. “After school I went custom cutting for a year just to kind of learn and see how other people farmed. I came back in 1988 and started farming with my dad, and in 1989 the drought hit. He sold half his cows, didn’t have any wheat, didn’t know if he’d have any hay to be able to keep the other half of the herd he kept. He told me, ‘you better go look for a job,’ and so I did,” Seaman recalls. Seaman has been at the research center ever since. He started on the sorghum project in May of 1989 and then joined the wheat project in February of 1998, where he worked with Martin, and now Zhang. Rohleder started at the research center five years ago. Before that, he was the foreman for a ranch just north of Hays for 40 years. He grew up on a farm northeast of Hays and said he’s been farming all his life. Rohleder lived in town and worked for a few years and then moved to the ranch in 1973 to become their foreman. “I tried sales in some jobs right out of college, and it wasn’t for me,” Rohleder said. Since Seaman started working on the wheat project, he’s seen changes in technology, the genesis of white wheat in Kansas and even leadership. When he first started, he was working for Martin, who was changing the program to all hard white winter wheat varieties because of the talk about white wheats taking over farmers’ operations in five years. But, that was 20 years ago, and hard white wheats haven’t taken over. Zhang is now working to have a happy medium of both hard white and hard red winter wheats because of the continued demand for the hard red winter wheats. Seaman says the technology in the equipment has also changed over the past 20 years. He said they were able to get a seed splitter onto the plot combine which has been a huge lifesaver for them. 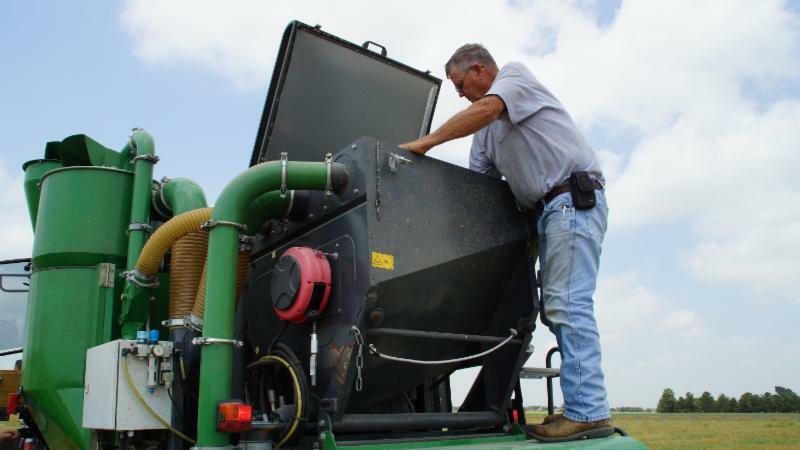 “Having the seed splitter on top allows us to only need one person on the back. If you’re planting six individual rows or two 3-row plots, you about needed to have two people on the back, and it’s hard to find help when you want to go plant in Garden City for two days,” Seeman said. Seaman has also seen GPS and autosteer incorporate into the planters, which has made significant differences in their operation at the research center. “Basically when I started it would take us about four to five hours to plant 300 KIN plots, but we can do it in about an hour and a half now with just the tractor and the planter,” Seaman said. Since starting, Seaman has also seen quite a few wheat varieties come out of the program and into the hands of farmers. The ones he’s been around to see are Trego, Lakin, Stanton, RonL, Tiger, Danby, Oakley CL, Clara CL, Joe and Tatanka. Joe, Tatanka and Oakley CL are still available to growers through Kansas Wheat Alliance. Seaman has seen a lot of changes and progressions during his 20 years at the research center in Hays. He can tell you anything you’d like to know about the wheat lines out in the plots, including the ones within their first years, but also be able to work on any piece of equipment that comes his way with issues. Both Rohleder and Seaman have made, and continue to make, positive contributions to the wheat breeding program in Hays. When thinking about the research and development that results in a new wheat, it’s important to remember that although some individuals might get paid more, or others get the public recognition, all are contributors critical to the success of the program. Kansas Wheat Alliance supports the wheat breeding program at the Kansas State University Agriculture Research Center in Hays and recognizes the vital role of those involved.